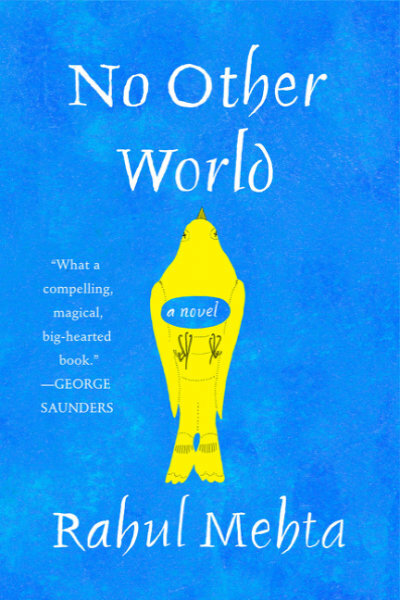 Rahul Mehta’s debut novel No Other World hurts to read because it hurts to watch his characters stumble and slip in the mess of their own humanness. Their desires and duties buffet them hard across the globe, while they spiral some illusory sense of who they are. The power of No Other World is how inextricably bound to this world Mehta’s characters are, and yet how untethered and restless they inevitably feel. Kiran Shah is an Indian-American boy growing up in 1980s Western New York, in a desolate landscape that leaves him time and room to roam. He becomes obsessed with his handsome, older neighbor, whom he discovers is having an affair with Kiran’s mother, Shanti, who moved to America for marriage. An image of Kiran’s older sister Preeti running and screaming from the woods troubles his childhood and strains their relationship into adulthood. And Kiran’s father Dr. Nishit Shah tries to reconcile his bond with Prabhu, the older brother he left behind in India. Slowly, Kiran comes to know how much he wishes to be seen and heard, but what words exist for his longing? In college, he shares with his crush Jeffrey a discomfiting story about a 14-year-old boy molesting an 8-year-old boy. In the story, the younger boy wants it, asks for it, seduces him. Yet Kiran lacks the literary language to express this desire, even if it was his own truth growing up: “if he knew the words to describe the constellation of water drops on Shawn’s chest, broad and wondrous as the night sky, proof of other worlds, other galaxies… or when he laid his ear on Shawn’s chest, thinking of what his father had once told him about the sound inside a seashell (‘It’s the sound of the ocean; the whole ocean is inside’), wondering at the ocean inside Shawn…” Jeffrey is disgusted, and Kiran is left wondering how his desires have betrayed him. Parul Sehgal writes that the immigrant novel, if such a thing can be said to exist, is an elegy to the lives who traverse oceans and turn out broken. Mehta’s characters long for lands and embraces they’re displaced from, even if it means telling themselves, as Shanti says, “You’re here now… Be here. Stop being there.” But do these characters “straddle” cultures, or are they shackled to both and neither? Shanti didn’t choose the hardships that an arranged marriage and migrating to a lonely American landscape would bring her. Still, she accepts this as her destiny. And as Kiran tells his parents, “I didn’t choose to be gay… but I would. If given the choice, I would choose to be gay every single time.” Prabhu’s illness affects his son Bharat; when both men come to stay with the Shahs, we see how their anxieties are inherited, even inevitable. No Other World finds strength in the devastatingly brilliant notion that fate isn’t premodern, or of another time. I want to catch all of Mehta’s precious metaphors and store them in my palms. Ray of Light, the name of a Christian church that Preeti converts to, translates to kiran in Hindi. Stray dogs wandering India’s streets stand in for society’s outsiders; brown dwarves populate our universe, roaming the cosmos as imposter stars and fake planets. Childhood toys “imprisoned and displaced” return to Kiran’s life after he’s tragically beaten. Of the myriad communities we don’t belong to, some are vast, others minute. On this very site, Mehta has been criticized for dropping songs into his work—something of a “show, don’t tell” injunction. But Mehta doesn’t learn. In No Other World, too, songs act as a lens into situated experiences. Bollywood item numbers may mean little for Western readers, but they mark the texture of South Asian immigrant life. Home for those shackled somewhere between worlds is pressing play and letting a cassette tape fill you with belonging—for no other world can hold you. These songs press on outsiders to lean in, to discover how different media affect different communities. A playlist catalogues a unique history of emotions, yearnings, and the specific sound that each human soul screams. In 1969, the late American photographer William Gedney traveled to India to document the quiet, daily rhythms of “people living precariously under difficulty.” His attention to the ripples of the everyday reminds me of Mehta’s literary eye. Kiran’s journey to India isn’t a way to go “back” home or back in time. Rather, his visit (from the Latin “to see”) is a meditation on viewing another world spinning next to the one he grew up in. It’s an opportunity to see an alternate self that could have lived, or “an infinite number of Kirans” living in other worlds. Wandering the village where his cousin Bharat lives, Kiran takes to amateur photography. Kiran arrives in India unaware of how much he doesn’t know. His friendship with the young hijra Pooja, however, frames and destabilizes his ignorance. One day, he attempts to capture Pooja as he sees her, with the light hitting her face just so. I thought of Gedney roaming Calcutta’s streets, hovering at the edge of his subjects’ lives. But Pooja’s portrait, after Kiran gets it developed, betrays his romantic vision of her, and she turns out looking “awkward and cheap.”Pooja is a beautifully drawn character, a teenage hijra whose inner generousness stretches beyond her small social position. She is deeply formative for Kiran, for she’s brave and bighearted, despite her reviled status as a member of India’s third gender. Pooja shows Kiran how to risk the stares of the world, how to sacrifice. Ultimately, his perspective of her cannot fully grasp the pain of the subaltern experience, even if the witness himself occupies an outsider, stray position. Mehta’s attempt to wrestle with difficult questions of representation and the Western gaze on the Other is a noble effort. Mehta’s artfulness is the deep empathy with which we nevertheless regard his characters, forced to live in small worlds they’re not fit for, worlds that cannot contain their complexities. I just finished “No Other World” last week, and loved it! Excellent review, Rajat. I felt it worth mentioning that in the story, Preeti does not run screaming from the woods, but is rather found bound and barely conscious by Kiran, and rescued (still unresponsive) several hours later by their uncle Prabhu visiting from India (Christ-like metaphor, foreshadowing her conversion?). The silhouette of Prabhu carrying Preeti, seemingly forming a “monster” with four arms, continues to haunt Kiran for years to come. I certainly hope we can expect more writing from Rahul Mehta!